I was all set to write this post on Monday, I took the photos, sat down at my computer in the corner of my sewing room and with a slight ping I was plunged into darkness, at first I thought it was a power cut, until I realised it was just my sewing room! The LED strip light had gone!! I’m hoping my son will come round tonight to wire up a new one as daylight is in short supply at this time of year! I have managed to continue my tidy-up in the garden. The drive is getting somewhat overgrown and my OH is chuntering about his new car, so I pruned back all the overhanging branches, cut out lots of dead wood and made a very big pile to go to the tip. I really need to take a saw to some of it as it does need a good chop but that will wait a little longer. I’m still concentrating on the patio area mainly. The clematis over the arch was starting to bud so I’ve given it it’s annual hard prune. I usually use the appearance of leaf buds as a good sign of when to prune a lot of shrubs. I climbed up onto the raised bed by the patio and had a good tidy up there too, the magnolia stellata is covered in flower buds so hopefully we’ll have a good show this year. They’ve still a long way to go before they flower but it’s encouraging to see them. Our garden is still in shadow all day, though the sun is getting nearer. We live in the lea of a big hill called the Chevin so we have to wait usually until mid to late February for the sunshine to light up the garden. I was very surprised therefore to see a bright patch of sunlight on the raised bed the other day. Something about it didn’t look quite right, like why just that area! I went outside to investigate and found the sun was actually reflected from an upstairs window! In my garden I have heavy clay soil, so if I find something grows well, I’ll buy one of each colour! I’ve had an idea following on from the success of my hellebores to plant some just in front of the rosa rugosa by the back fence, they make good ground cover, don’t mind dappled shade and look good in the winter. So I bought another four! I’ve got a pretty speckled purple one, a pink one and two creamy ones. I’m just waiting for the soil to defrost a bit before I plant them. The sweet box is coming into flower at the moment, I bought it for it’s winter scent which is very strong, especially considering the size of the flowers. The scent isn’t noticeable yet, so I’m presuming the flowers aren’t fully open yet. There’s a pretty little blue flower appeared near the pond and I can’t for the life of me remember what it’s called, the leaves are the big rounded ones you can see, it’s a gorgeous shade of blue. If anyone recognises it please do tell! 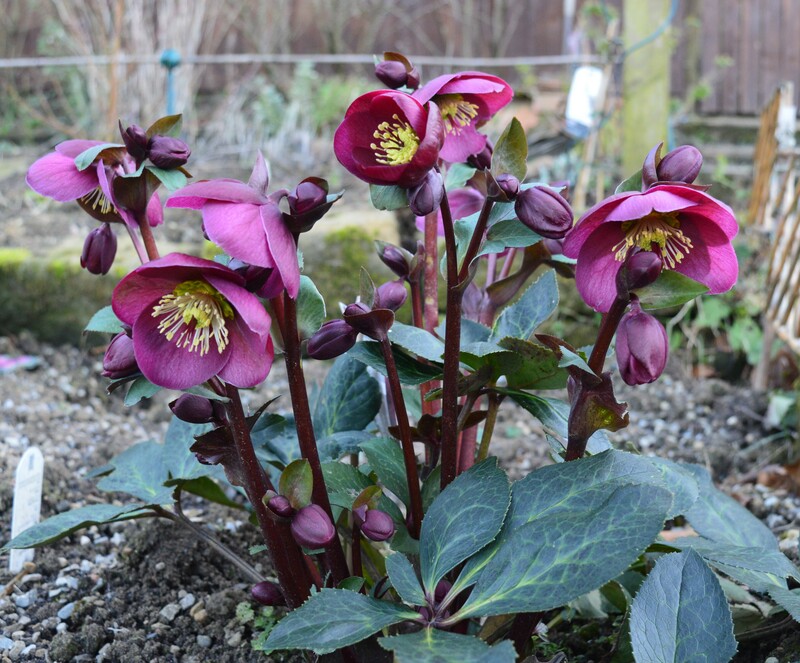 This entry was posted in Garden and tagged hellebores, Winter Garden. Bookmark the permalink. Just love this time of year -new promise! Your garden is way ahead of mine. We are in a deep freeze right now. Just seeing all that you are able to do in the garden AND blooms, makes me want to do something, see something blooming here. It will be awhile. So much promise of beauty in your garden, although the little things, like that blue flower, are very sweet too. The hellebores are stunning ~ no wonder you want more of them. Do they self-seed? We had a lovely dump of rain last night, so my garden is quite happy at the moment, although some leaves are very scorched from the blast of heat we had earlier. Hellebores do self seed and are well known for cross-pollinating, so you can get lots of interesting mixes! gardens always look so messy at this time of your don’t they! but lovely to see some early bulbs up. We’ve talked hellebore before – I have a few and added a new creamy one too. I didn’t know they self-seed so I was delighted to read that above. Your garden looks wonderful! So much fun to see your shoots and hellebores coming through. It was -5 F. Yesterday morning, so we have a ways to go, but it is now only dusky at 5:00 so we are making progress! Lovely to see flowers! Our’s haven’t come out yet.